Trees in a green park, with green grass - green everywhere. It's a balancing act to handle that much green. 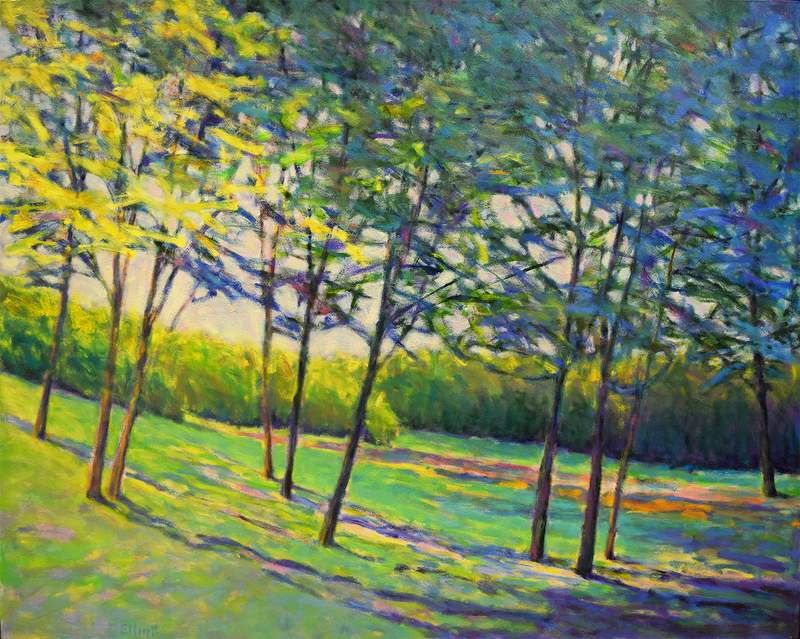 For many landscape artists, green creates a lot of difficulty - myself included for many years. This oil is the larger version of a 36 x 36 oil completed in late 2015. The play of light from left to right is the obvious part and it sets up the entire painting, but the background (pun) story here is how to use a larger number of greens and keep everything fresh. For this work, I started with a number of greens and blue-greens on the palette, along with light, medium and dark grays. Virtually all of the greens were mixed with one of those grays, yielding an interesting group of colors without that out-of-the tube look. The greens also got a lot of support from the blues, purples, pinks and the dark contrasts. I just kept pushing the colors with brighter blues, aquas and mauves to take the painting further. Once it was done... it wasn't done. I continued to tune it for another two weeks, very small touches of a couple of minutes each. There is a lot of surface area here and I made sure that every part of the canvas was alive and radiant. There was never any pressure to finish, only to make a large and compelling work. Once it was completed, it felt like a full orchestra played the last bar, packed and left the studio. There was that empty spot in the room for a short time and then new starts began to fill the space.